Now available from the So Far from God range of 10mm Mexican-American War figures by Good Ground. The Jalisco Lancers are available as individual packs or as a regimental pack. The Tulancingo Cuirassier are also available in the same packaging. Mexican Mounted Generals in four poses are now up for sale on the site as well. Finally we are now offering the superb Joseph Hefter work "The Mexican Soldier", faithfully reproduced by The Virtual Armchair General. It is the perfect painting guide for those painting and collecting our So Far from God range. Cracker Line – Tenting Tonight! I painted this set of tents as soon as I could for the purpose of showing the detail our sculptor Paul was able to get into these little beauties. They are not just little resin triangles. Take a close look at the shelter halves. The detail is amazing. Also note the open and closed flap options on the Sibleys. These little gems are available only from Good Ground Miniatures. Is Your Camp On Good Ground? Now available for sale on the site are the new tents packs. The pack comes with five types of the most common American Civil War era tents. They are the work of our talented Paul Bernardino. Paul even managed to get the chimneys on the Sibley tents! There are twelve tents in a pack and they are hard resin-plastic, a new mixture which is very strong and very light. These tents are available for sale on the website under the Between the Lines link on the left navigation bar. There is more great new stuff on the way so keep your eye on the Good Ground website for details. We are proud to announce the latest 10mm structures for Between the Lines Models from Good Ground Miniatures. 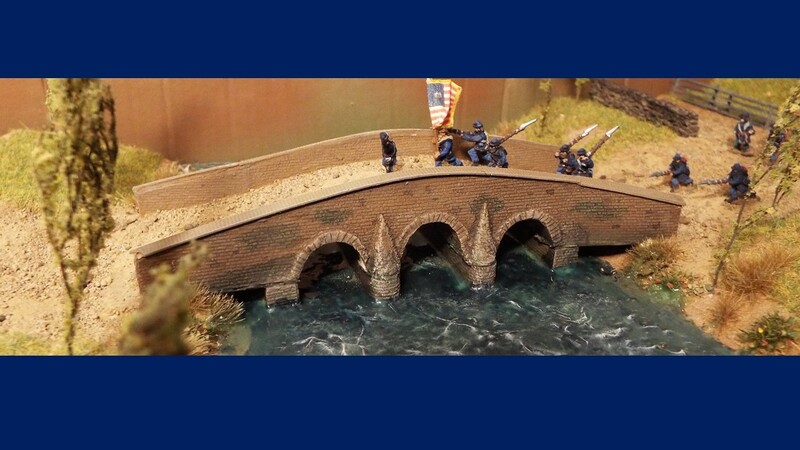 We have added the Rohrbach Bridge AKA Burnside's Bridge from the Battle of Antietam. The bridge is approximately 5 1/4" long and has separately cast abutments so that players wishing to use this piece on flat terrain may if so desired. The bridge is 1 1/8" wide in order to accomodate 1" wide Fire & Fury bases. Also new to the line is the Carter Smokehouse from Franklin. The building completes the five building Carter Compound which includes the Cotton Gin, the Carter Home, Farm Office, Kitchen and Smokehouse. The bridge was created by Paul Bernardino and the Smoke House by Mike Randles. Paul is now working on tents of various types while Mike is hard at work with the Tishomingo Hotel from the Battle of Corinth. Finally, in the process of casting are the first of the "So Far From God" line of 10mm Mexican-American War figures. US Regulars in M1839 Forage Caps plus command. These will be available for sale in February. Of course, they can be easily adopted as early-war Confederates. More to come in 2018 as the MAW line expands. First up will be the Carter smokehouse from Mike Randles, which will complete the five buidling Carter home and outbuildings, including the cotton gin. Closely following this will be Rohrbach Bridge (aka Burnside's Bridge) from Paul Bernardino. Paul is also working on tents of all types, which many of my customers have requested over the last year. Finally, to go with our little pack howitzer, we will release a packed howitzer 3 mule team. It will be a busy holiday season for the staff at Good Ground Miniatures.